The capital of South Korea is the most populated and modern city in the country. It’s also an ideal location to take depositions. Suwon is home to Samsung’s headquarters. Although it is a 40 – 60 minute taxi ride from Seoul, attorneys often elect to commute to maintain the luxury of staying in Seoul. 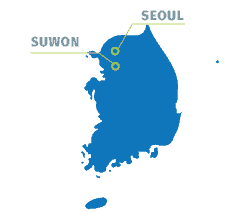 However, for convenience, many attorneys stay in Suwon. Planet Depos has extensive experience in Suwon and is happy to offer suggestions related to hotels and deposition venues. Planet Depos Travel Tip: Did you know Suwon is home to the world’s first Toilet Theme Park? Depositions are sometimes taken in the coastal cities, such as Pohang. This is not an ideal location as it requires additional travel, but it is possible to fly into the Pohang Airport rather than traveling via public transportation or car. Planet Depos Travel Tip: If you plan to take depositions in Pohang, be sure you bring your bathing suit and take in one of the games of the Pohang Steelers, a South Korean professional football club located in the city. South Korea is a member of the The Hague Evidence Convention. Permission from the government is not required for depositions of willing witnesses in South Korea. Please contact international@planetdepos.com for more information. Depositions can be taken at any location or time. Court reporters are not authorized to administer the oath in South Korea, so the oath will need to be stipulated on the record. Another option would be to apply to the court for a Commission to Administer Oaths. American-trained court reporters and videographers living in South Korea. Before you plan your deposition in South Korea, make sure you read our deposition checklist. We can provide conference rooms anywhere in South Korea that you may need.